On Wednesday, October 2, the contestants of the competition visited various locations of the Continental Region, specifically the province of Wele-Nzas. The delegation was received by the Governor, Deogracias Miguel Olo Abia. 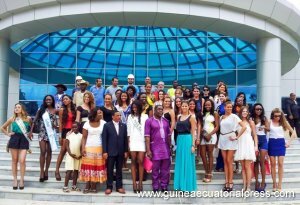 The models, who were accompanied by a delegation led by the Secretary of State for Tourism and Culture, Jose Antonio Abeso Ondo Maquina, and that of Information, Press and Radio, Juan Noel Nsue Ondo; the Director-General of Tourism, Prudencio Botey Sobole, and the Vice President of Miss World Tourism, Alina Ciorogariu, among others, landed at the Mongomeyen airport, where they were received by the Governor of Wele-Nzas, Deogracias Miguel Olo Abia and the Government delegate of the Mongomo district, Clara Mangue Ndong. The journey of this adventure through Wele-Nzas began in the new and majestic city of Oyala, where they were received by the heads of the companies that carry out their activities in the locality. The workers, amazed by so much beauty, set about finding the beauty queens of their respective countries to take some souvenir snapshots. In the same city, which is still under construction, the delegation visited the works on the river Wele and the Hotel Mongomo where, minutes before lunch, Olomo Abia thanked the beauty queens for their visit to Equatorial Guinea, and in particular to the province Wele-Nzas. For her part, the Vice President, Alina Ciorogariu, on behalf of the participants, thanked the Government for hosting this international event, and highlighted the hospitality with which they are being received throughout the country. In the city of Mongomo, the commission visited the iconic basilica, where the beauty queens, enthusiastic about the interior decoration of the temple, were photographed. This happy journey culminated at the National School of Hotel Management, where they were received by the directors, teachers and students. In an adjoining warehouse was the makeup room, where the committee stayed while they waited for the rain to stop, which had begun to fall upon their arrival in Mongomo. Later, they visited the border of the Republic of Gabon and, back at the airport, the models decided to dance with the chorus of dancers from the area.